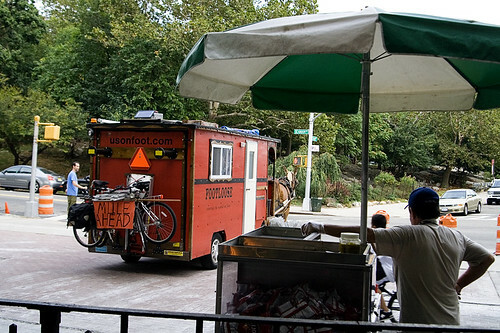 So there I was, minding my own business, finishing up the last bites of a slice of ultra thin crust pineapple and ham pizza when I looked up and saw a mule pulling a small wagon down Isham Street toward Inwood Hill Park. Yes I was surprised, we don’t see large four legged animals up in my neck of the woods. Dogs, yes. Mules, no! Fortunately they stopped for a brief moment in the park, and I snagged this shot. Quite profound wouldn’t you say? The mule gazing off into the urban distance. 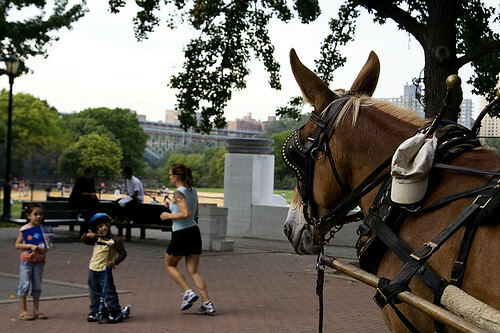 The mule & owners ended up spending the night at the Van Cortland Park stables in The Bronx. It turns out that the couple (Bud & Kenny) are planning to travel the world on foot. You can read about their travels, gawk at their solar powered trailer, or donate to support their journey at http://www.usonfoot.com/. Anyway, it’s just not something you see every day on the streets of New York. Don't you pretty much see 'something you don't see every day' every day in New York? I hope Bud and Kenny are taking good pictures! So not what I expected after reading the title. Ha, Ha. Is that thing too heavy for the poor mule to pull?